Drink gin, straight. (Also, navy strength rum if you're feeling tough). Let's chat about my little trip inside the Insta-worthy East London Liquor Company for a bit of gin tasting. It's always a good thing when two of your favourite things mix isn't it? Well I had an opportunity this May which saw me combine two of my very favourite things. Blogging and gin. Perfect right? 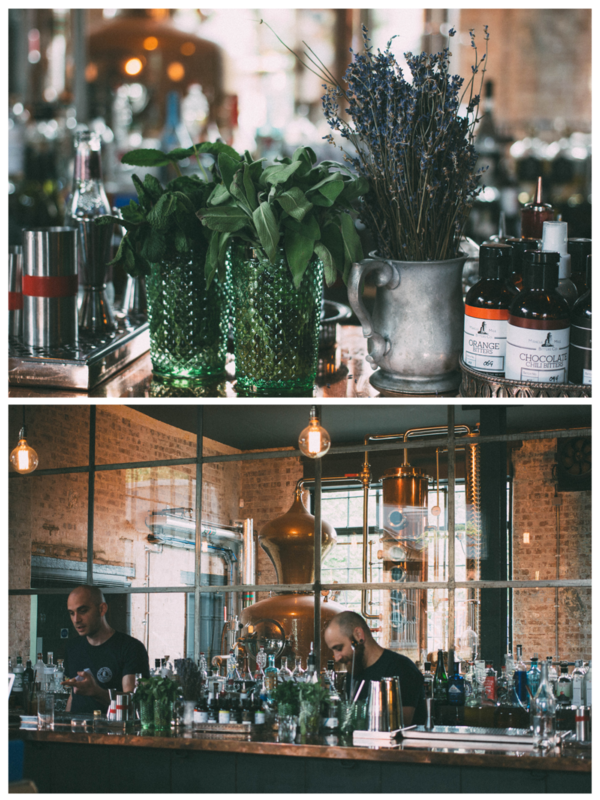 I headed to the beautifully Instagrammable East London Liquor Company based in the Bow area with the UNiDAYS team to try out a Virgin Experience Day there. If like me, you had thought that Virgin Experience Days consisted strictly of hot air balloon rides and Ferarri driving and nothing more a younger persons taste, well you too are wrong. Virgin Experience Days actually have a tonne of really fun activities to get stuck into, plus with 20% off for students (see the bottom of this post!) - it's almost impossible to not give them a go! Going into this Virgin Experience Day I was pretty damn excited, I've been to a few similar things in the past. I've been to distilleries and breweries before, plus done my fair share of wine tasting but alcohol tasting inside the actual distillery? This was a new one for me! Upon arrival we were taken down to the cellar which was filled to the brim with ageing whiskey casks. Did you know that they need to sit for three years in an oak cask before you can have a sip? Nope, I didn't either until this experience! We took our seat at the bar located in the middle of the room and was greeted by our host Alex. We started off strong with some of their vodka - as we went Alex was able to give us insights into the process and (some) of the ingredients. We spoke a lot about how the spirit smelt and tasted, we were offered jars of the main ingredients. It turns out everyone tastes the spirit slightly differently so whilst some of us could smell/taste certain botanicals - other's couldn't! We moved at a steady pace through three of their best known gins (all London Dry) - we debated over our favourites and by the end of it our mouths were so used to sipping these strong spirits - we no longer were feeling the burn! Think I'll be sipping any shots I'm doing in the future! Lastly we tried a Navy Strength rum. What is Navy Strength rum you ask? Well, any rum over 59%! They used to load it onto the ships in casks and plonk them next to the gun powder - any less that 59% couldn't go on incase it spilled onto the powder and the level of water wouldn't of allowed the gun powder to fire! After our fun and insightful tasting we headed up to the bar for a good old gin and tonic. Which tasted surprisingly tasted almost non-alcoholic after all of those straight shots! We ended the session with a good old blogger photo time and taken these idealic shots of the beautiful interiors. All in all, this place is bloomin' gorgeous and the experience was so insightful and different. If you are a gin fan or you know someone who is, this is definetly a great experience to buy! Being in a bar I wanted to be slightly more dressed up than my usual slogan tee and jeans set up. This Topshop blouse was exactly what I needed to up the anti. Pairing it with a pair of relaxed blue jeans and flats made the ultimate chilled 'just gone for a few drinks' outfit. Plus who knew my jacket could go with the interiors so well? The venue is based in Bow, not too far from the lovely Victoria Park. It's a short walk from Mile End tube station, so perfect if you fancy heading central after the tasting! I was shocked to discover that the now distillery has a pretty dark history. The building was once a glue factory, seeing the demise of many horses all in name of the sticky substance. There's even a little ode to these poor creatures on each bottle produced by East London Liquor Company. I'll let you spot it for yourselves! The interiors are gorgeous, industrial, almost New York loft kinda style. Exposed brick walls, copper, open shelving and a lot of wood. As you may or may not know spirits need to be distilled in copper, I won't give away the secret as to why but these guys have made full use of this beautiful process by adding a big ol' clear window behind the bar. Plus, for those summery warm days (which have ~finally~ started gracing us again) there's a rather large courtyard surrounded by pretty blooms and greenery. Ultimately the location is bloody gorgeous. Click here to book your Gin Tasting Experience with 20% off for students! So let's chat a little about UNiDAYS. Chances are if you are a student or have been a student you will know about it and will use it nearly on a daily basis. But if you have managed to slip through the cracks, let me fill you in. UNiDAYS is a free discount site / app for students. All your favourite brands, from the ones you need for in the lecture theatre to the ones you just bloomin' love all in one place. In-store or online it's simple and easy to use. All your discounts you see straight off the total price at the checkout. From ASOS to Zalando, there's so many amazing brands all offering decent discounts. Not to mention all the other wicked stuff the offer, from a blog written by the lovely Allie (cool name..) and competitions that happen almost weekly it seems. If you're a student, you need to make the most of these incredible benefits! Sign up is quick and easy to get going, so why not head over there now? Please note this post was in collaboration with UNiDAYS but all thoughts are my own.